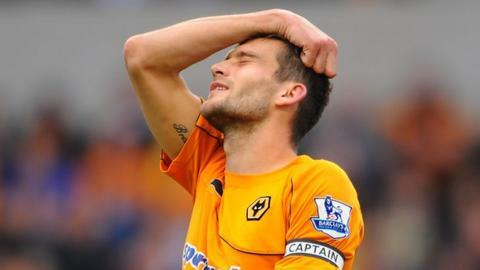 Wolves have come to an agreement with former captain Roger Johnson to terminate the remainder of his contract after more than a season and a half out of favour at Molineux. The 31-year-old centre-back, signed for £4m by Mick McCarthy from Birmingham City in the summer of 2011, was under contract until the end of this season. But Wolves have taken the decision to get him off the payroll now. Johnson, who now becomes a free agent, has been linked with Charlton Athletic. The former Wycombe Wanderers and Cardiff City defender was a League Cup winner at Wembley with Birmingham just four years ago, only to leave Blues following relegation to sign for Wolves. But he was to suffer two more relegations in successive seasons with Wolves, as the club crashed from the Premier League to League One. And Johnson, made skipper by McCarthy in place of Karl Henry when he first arrived, found himself the focal point of fans' frustrations, fuelled by his dropping by then-caretaker manager Terry Connor after turning up one Monday morning "unfit to train properly". His last game for Wolves was the final-day relegation-sealing Championship defeat at Brighton in May 2013. Following that, he - along with Henry, Jamie O'Hara and Stephen Ward - was one of four players placed on the transfer list. He has remained available ever since and out in the cold at Molineux, unused by Wolves head coach Kenny Jackett and forced at times to train with the club's academy squad.